I know that this site is predominantly aimed at Christians, but it also attracts a good number of people who wouldn’t call themselves Christian. If that applies to you then you are very welcome here! One of the frustrations of commenting on current affairs from a Christian perspective is how clueless some in the media and also politics can be when it comes to understanding even the basics of the Christian faith. Partly that’s the fault of Christians for not making the effort to explain ourselves clearly, but some of it too is sloppy journalistic assumptions or plain ignorance. Regularly I see the common mistake of misunderstanding the differences between cultural Christianity and what I would call genuine Christianity, i.e. a faith based on the teachings of the Bible and an encounter with Jesus Christ. Despite what some many think Christianity is not the Church of England or the Catholic Church. It’s not bishops, vicars, jumble sales or turning up to church, singing hymns and listening to a drab sermon. Although some might wish it was, Christianity is not the Vicar of Dibley or Rev, although Rev does come a lot closer to the truth. It’s much, much bigger and at the same time more personal than all of this. For those of us who are willing or curious enough to take an interest in trying to understand what Christianity is and isn’t, there are usually going to be a whole load of questions we’re going to want to have answered: Who or what is God if he/it does exist? Why would anyone think that a book written two millennia ago is still relevant? Why would it make any difference if someone believes in God or not? All of this leads me to a plug for the Alpha Course. And there are two reasons why I’m doing this. The first is that doing it really is an excellent way to explore the basics of the Christian faith in a friendly, honest and informal environment. 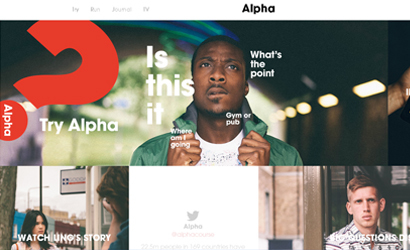 Over two and a half million people in the UK alone have now been on an Alpha course. It’s popular because it’s accessible and delivers the goods. No, I haven’t tried Alpha and I don’t think I will any time soon. For people like me Christianity is a tainted religion. There are seven reasons why I’ll never set foot in any church that bases its beliefs on that motley set of writings known as the Bible. These reasons are commonly known as the “clobber passages” and they tell me that if there is a God, and if he’s anything like the deity described in Christian scripture, then he’s a nasty, homophobic bigot who creates some of us solely for the purpose of living lives of pure misery. He plonks us in bigoted families, surrounds us by bigoted peers and then compounds the torture by telling us that if we ever fall in love and find intimacy and happiness, we’re doomed to eternal hellfire and damnation. However slick the sales presentation, there are some products you just can’t sell to certain people. Trying to sell Christianity to the LGBT community is like trying to sell peanut butter to nut allergy sufferers. You’ll always get a few gullible souls who’ll fall for the sales pitch and then choke to death on the poison you’ve flogged to them, but most of us know what’s good for us and won’t touch your noxious wares with a barge pole. But we will wonder why you’re so eager to watch us curl up and die in front of you. If you’re gay, never trust a Christian. Never let one in your home. Know that their dearest desire is to see you suffer lifelong torture as a sacrificial victim to their prejudices deified. Resist them. Vote against their candidates, scupper their policies and generally sideline and thwart them. Step inside their churches at your peril. Their God hates you and no matter how much they blether on about love and charity and wanting the best for you, so do they. After reading your comments, I really believe you should try Alpha. No one cares who you are or what you think about Christianity. Is designed for people like you that judges God without knowing God. Lastly I run Alpha and I teach Bible study and my daughter is gay and married. You’re crazy to think that I would not love my daughter or that I think shes not going to go to heaven. You are confused and need to do real research about God and the bible before you judge…By the way Jesus died for you…gay or not…He loves you and God gave his only son Jesus to die for your sins. So don’t get it twisted. ..He loves you and died for you no matter what you are. We are all sinners…and if you go to hell it won’t be because your gay it will be because you refused His love and grace..